Written by Jaxon S on Thursday, June 26th, 2008 in Borneo Politics, Borneo Travel. 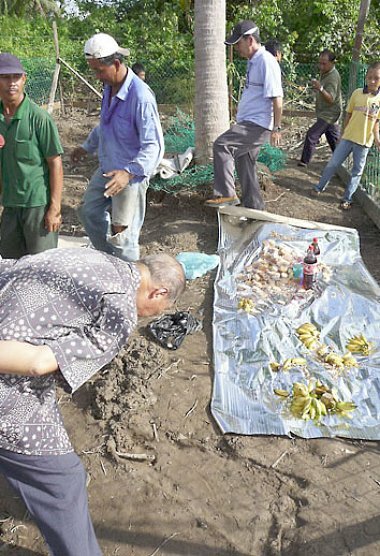 If it has been easy to resolve, Sabah’s illegal immigrant problems would have been resolved by now. If the political will has been strong to resolve the issue, we won’t be cancered by the problem. Written by Jaxon S on Sunday, June 22nd, 2008 in Borneo Diaspora. Written by Jaxon S on Friday, June 20th, 2008 in Borneo Miscellaneous Stories, Borneo Politics. I was once a part-time reporter with a national newspaper. Back then, and still is, they call part-time reporters “stringers”, although none of their job involves stringing strings (for want of a better pun). That was in the early 90’s and Datuk Seri Joseph Pairin Kitingan was still the Sabah Chief Minister and Datuk Yong Teck Lee his deputy, if my memory serves me right. Sometime in 1993, I was assigned to cover an event at Seri Bersatu, Pairin’s residence in Luyang near Kota Kinabalu, the capital city of the Malaysian state of Sabah. I could not remember what exactly the event was — it might have been a Harvest Festival celebration or a Parti Bersatu Sabah (PBS) anniversary, but I remember there was partying, and singing, and the food was great. I still remember Datuk Lawrence Gimbang was singing “Biarku Menjadi Lilin” that night and did quite a nice rendition of the song. 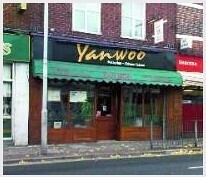 Well, it wasn’t great — as Simon Cowell would have put it — but it wasn’t terrible. Now we know from whom Rich of Akadami Fantasia got his singing talent. I also remember the sharp, stinging and definitive sound of an electric guitar in the hands of Datuk Hassan Alban Sandukong, who was Sabah Legislative Assembly Speaker at the time, again if my memory serves me right – about Alban’s post, I mean; not the guitar. I remember the guitar well because guitar-playing politician was quite a sight for me — the greenhorn stringer — back then. Hassan Alban is no Eric Clapton but man, he can still play the blues. Then there was Yong, the then PBS Deputy President, whom we — the reporters — bumped into while filling our plates with food. He greeted us and told us how great the party was. But there was something else he said that night that is flooding back to me now like an old dream. I guess, we, the reporters, must have remarked about the food and had probably asked him if he had taken his. He told us that he in fact had, and that he was just walking around “to get an idea how to make a party”. That was many more months before he finally made the party and it had nothing to do with playing guitar or singing about becoming a candle. His party is called Parti Maju Sabah or Sabah Progressive Party (SAPP). Written by Jaxon S on Wednesday, June 18th, 2008 in Borneo Politics. The Sabah Progressive Party (SAPP), a Sabah-based component party of the ruling Barisan Nasional, said today it had lost confidence in Malaysian Prime Minister Abdullah Ahmad Badawi. In the coming sitting of the Parliament session on Monday, its two Members of Parliament will support a vote of no confidence against the Prime Minister, the party said. [Further details in The Star]. 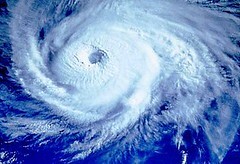 Up to you to decide whether the Typhoon Sapp is indeed a typhoon or just a storm in the teacup. “Whether its MPs table the vote of no confidence, or whether other MPs will do it, would be determined in due course,” the party said in a statement. In the meantime, the Sanglang state seat in Perlis has been declared vacant by an election court. Meaning there is going to could be a by-election. The seat was won by Barisan Nasional in the March 8 general election. Alternatively, the Election Commission can just declare the other candidate, from Pas, as the winner. So it’s going to be just like in the song, dari Perlis sampailah ke Sabah… at least for today lah. Written by Jaxon S on Tuesday, June 17th, 2008 in Borneo Politics. Written by Jaxon S on Tuesday, June 17th, 2008 in Borneo Myth And Legend, Borneo Odds And Ends. Written by Jaxon S on Sunday, June 15th, 2008 in Borneo Development Issues, Borneo Environment, Borneo Logging. Borneo is losing its forest and losing it fast, especially in Kalimantan, the Indonesian part of Borneo Island. 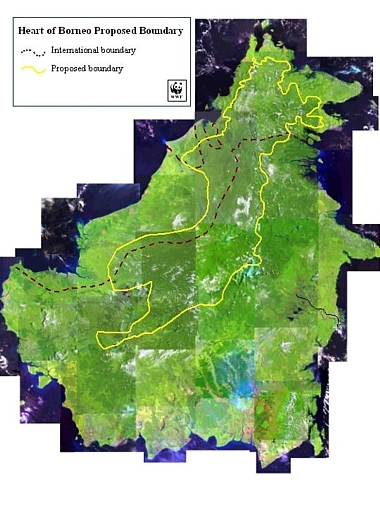 Sabah is not doing too bad according to the WWF map below and if some of the powers-that-be in Sabah and Malaysia could still make it right, there is every possibility that the vast tract of forested land will remain where its is. There is hope. 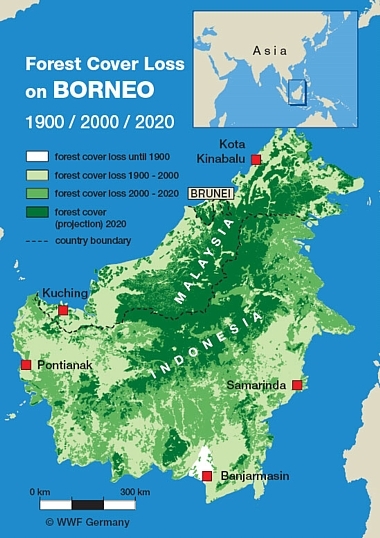 If and only if the governments of Malaysia and Indonesia as well as those of Sabah, Sarawak and Kalimantan are keeping to their promises of preserving the Heart of Borneo as shown below. Written by Jaxon S on Saturday, June 14th, 2008 in Borneo Miscellaneous Stories, Borneo Myth And Legend, Borneo Odds And Ends. Written by Jaxon S on Saturday, June 14th, 2008 in Borneo Miscellaneous Stories, Brunei. Prince Jefri, the younger brother of the Sultan of Brunei, is on the run rather than face jail for refusing to hand over over £3 billion (RM15.1 billion) of assets to the Sultanate. Reports said the flamboyant prince was issued with a warrant of arrest by a British judge on June 11 for failing to turn up for a five-day hearing for contempt of court. Prince Jefri, who denied any wrongdoing and said he had authority to use state funds, took his case to the Privy Council in London last year but lost. Brunei sources say that he has since surrendered a few diamonds but held on to other assets. Brunei has adopted a hard line, applying to the High Court in London to commit the Prince to prison for contempt of court. Friends of Prince Jefri are shocked at what they see as the harshness of the Sultan in attempting to get his youngest brother locked up. The Prince’s friends said that Brunei’s attempt to get him jailed was “purely vindictive”, serving no purpose “other than to extract punitive revenge on your brother”. Written by Jaxon S on Friday, June 13th, 2008 in Borneo Miscellaneous Stories, Borneo Myth And Legend, Borneo Odds And Ends.